A fireplace can be a beautiful focal point in any room. What once was a source for heating homes has turned into a luxury feature in newer homes. Sadly many tract builder homes have down graded this amazing feature with simple trim details. 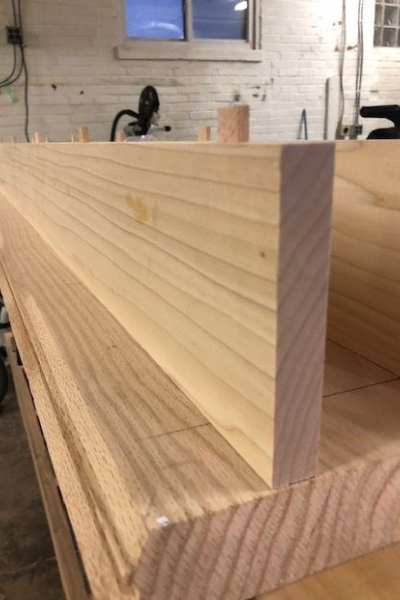 While trim pieces work for a fireplace and mantel when done well, much like in the Victorian era, the way they are constructed now usually leave a little to be desired. 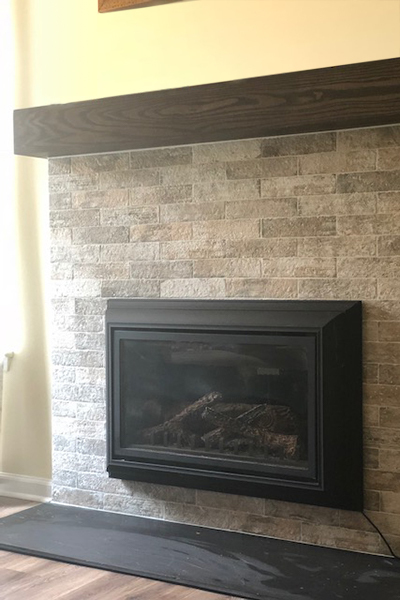 For this reason many people are looking for a fireplace and mantel renovation even in their new homes. Fireplaces date way back. In the 1600’s and early 1700’s they were used mostly for heating the home as well as cooking and baking. They didn’t have much of a mantel if at all. Think Little House on the Prairie. They were the hub of the home. While most do not use their fireplaces for cooking any longer, everyone wants to gather around the fireplace. A fireplace offers a great place to gather on a brisk evening with a good book and cup of tea or for the kids to defrost after playing in the snow for hours or just create a little ambiance during a dinner party. The right mantel is the finishing touch to any fireplace design. Style, scale, material all come into play. I was contracted to redesign this builder specified fireplace and mantel as a part of a first floor renovation. This homeowner wasn’t afraid to use color – which I applaud. So many people are afraid of color. 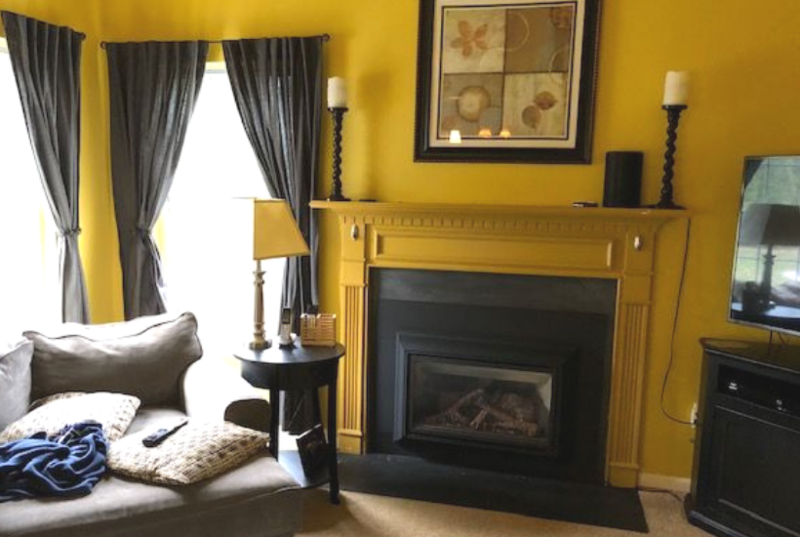 While I applaud their fearless use of color, the fireplace and mantel got a little lost as a focal point since it was painted the same color as the walls. The homeowner was looking for something simplistic, modern, bright and airy. The modern floating mantel is constructed from oak and created in a local craftsman’s workshop. 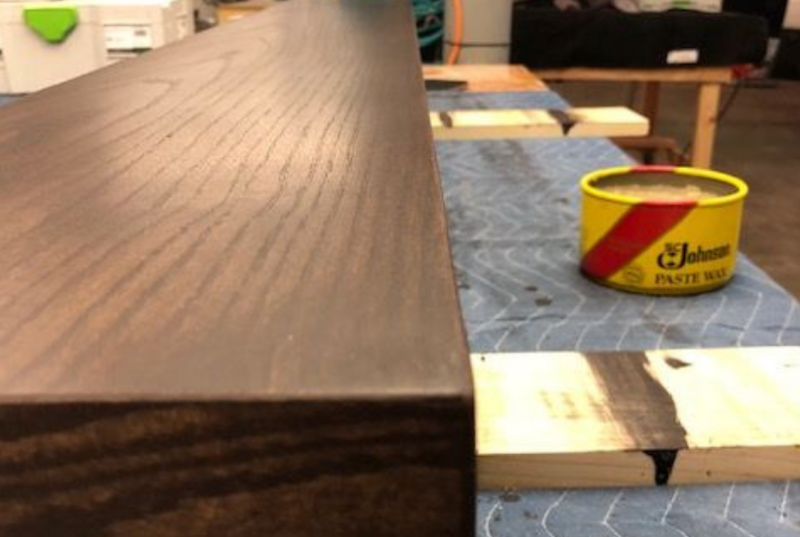 He created this simplistic style mantel to be mounted on custom mounting hardware. The stain chosen is Minwax Ebony. The stain wasn’t as dark as we wanted. (another reason why hiring a professional is ALWAYS a good idea,). He knew how to use a special staining method that involved wetting the wood so it would absorb more stain, thus making it darker. It worked beautifully and gave us the deep rich color we were after. 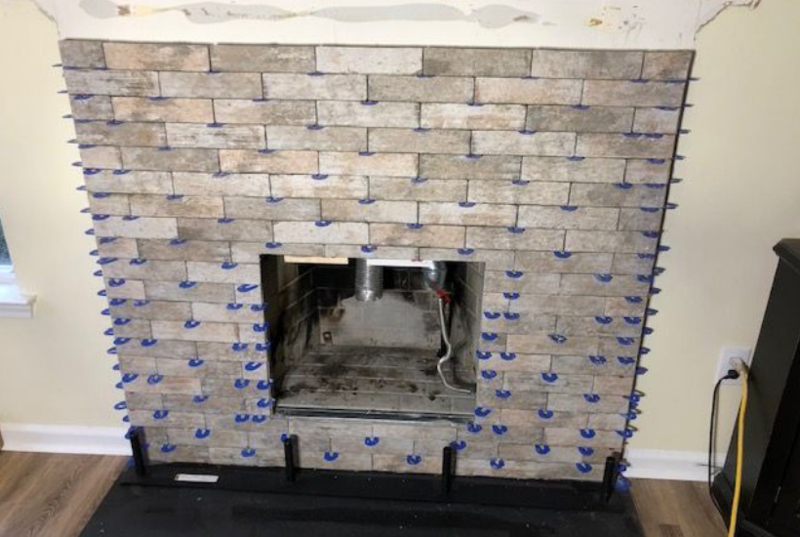 Working closely with the contractor we decided to build out the fireplace surround so it wouldn’t be flat on the wall. This created depth and gave substance to the simple gas insert that was there. 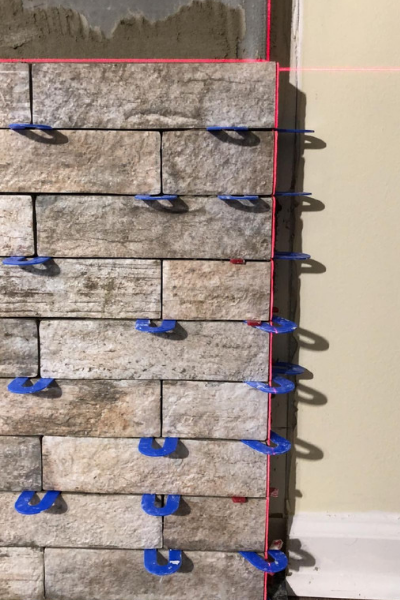 The grout lines are minimal to keep with the simplistic nature of the design. I can’t stress enough the importance of hiring the right professional for a project like this. It makes a huge difference for not just the look but longevity of the design as well. Nobody wants to spend money on something that is done poorly or needs to be done again in a few years because it didn’t stand the test of time. The mantel is mounted on the custom mounting hardware by sliding it into place, then securing it appropriately. This gives the simple clean lines we needed. No mounting hardware is seen in this installation. The end result is light, bright and airy with a statement mantel piece. This project took several weeks of designing, coordinating with the contractor and client. The homeowner is thrilled with the new focal point, clean lines and modern feel to the design. 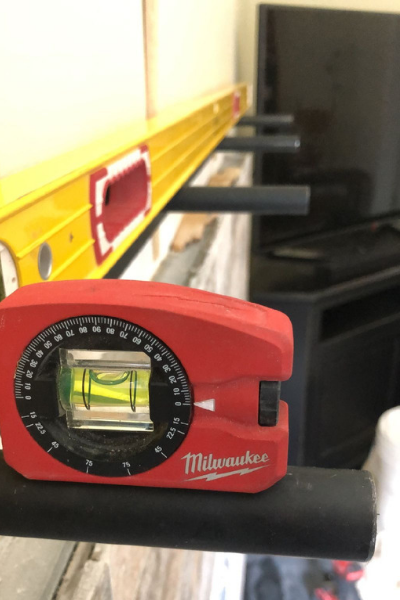 Looking for some help getting a project off the ground? Want someone to handle the design and you take it from there? Prefer to hand it off to someone and have them handle the design through construction? No worries, we customize our packages to our clients and their needs. The level of involvement is up to you. Let’s chat if you’re ready to tackle your design challenge. Don’t miss a post! Sign up to be a part of our design trendy family…get tips and tricks and see our projects before anyone else! Sign up here for your monthly look at the latest in design & styling trends.